Even from beyond the grave, Dr. King will not remain silent about the injustices and tragedies of the world. His words are still a rallying cry for those who wish to see God’s vision made into a reality. But some, with untold power, continue to manipulate his words for their own gain. The Psalmist says, “Our God comes and does not keep silence.” The Word from the Lord blasts forth from the pages of our bibles, like the words of Dr. King’s sermon, and they beckon us to open our eyes to the truth. We live in a world that is still terribly broken and in need of divine healing. The marginalized are being pushed even further into the margins while the powers and principalities rule with an iron fist. God will not keep silence, and neither should we. You can read more about the Dodge Ram Commercial controversy here: MLK Jr. Sermon Used In A Ram Trucks Super Bowl Commercial Draws Backlash. Now concerning food sacrificed to idols: we know that “all of us possess knowledge.” Knowledge puffs up, but love builds up. Anyone who claims to know something does not yet have the necessary knowledge; but anyone who loves God is known by him. Hence, as to the eating of food offered to idols, we know that “no idol in the world really exists,” and that, “there is no God but one.” Indeed, even though there may be so-called gods in heaven or on earth – as in fact there are many gods and many lords – yet for us there is one God, the Father, from whom are all things and for whom we exist, and one Lord, Jesus Christ, through whom are all things and through whom we exist. It is not everyone, however, who has this knowledge. Since some have become so accustomed to idols until now, they still think of the food they eat as food offered to an idol; and their conscience, being weak, is defiled. “Food will not bring us closer to God.” We are no worse off if we do not eat, and no better off if we do. But take care that this liberty of yours does not somehow become a stumbling block to the weak. Here’s the situation: The church in Corinth had lots of issues and Paul, as an apostle, wrote to them addressing a number of concerns and problems. At times he wrote about sexual immorality, at others he wrote about the importance of inviting everyone to receive the Lord’s Supper, but here in chapter 8, he brings up the issue of eating meat that was sacrificed to idols. In Corinth, the elite would sacrifice their livestock to idols and then share the food with others. For some of the Corinthians they believed it was perfectly fine to eat the meat because they knew there is only one Lord and eating food would never bring them closer to God. However, others believed that if they ate some of the meat that was formerly sacrificed, they would be supporting the belief system in idols and would therefore be committing heresy. Is this still an issue for us today? Unless your butcher is praying to satan before he/she presents your beef, then this probably does not affect you. However, this passage is not merely just about meat sacrificed to idols, and in fact is still relevant to us today. When I moved into the parsonage I was very excited. I had spent my entire life either living with my family, or sharing apartments with roommates. For the very first time I would be living in a house, with a yard that I could take care of, with a fireplace that I could actually burn wood in! I would be living on a street with neighbors, and I casually day dreamt about someone knocking on the door to ask for some sugar. Staunton was going to be my Mayberry. Yet, after moving everything in and getting settled I still felt isolated. I had our church community, of course, but I really wanted to meet my neighbors and create new relationships. I waited for them to stop by the house, but no one ever came. That’s when Lindsey and I decided to throw the first ever Bowie Street Bash. 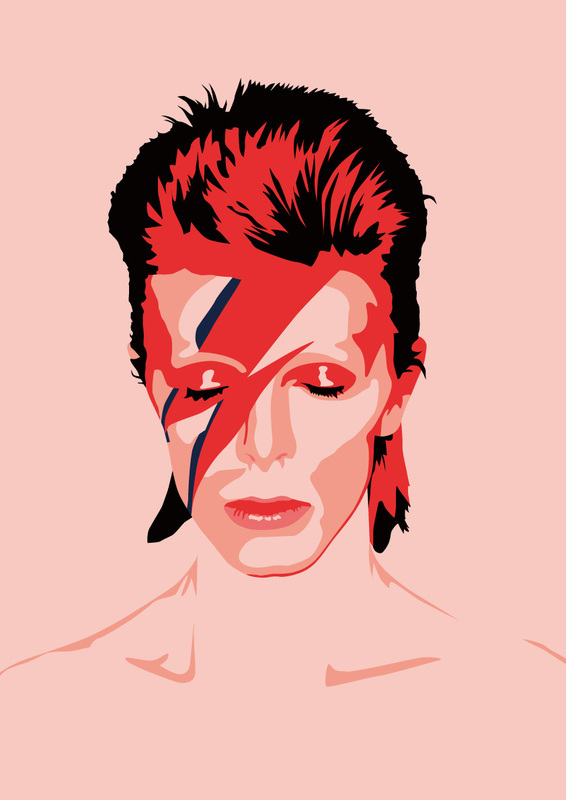 We actually wanted it to be David Bowie themed, but we were a little worried how our neighbors would respond to me dressing up like Ziggy Stardust complete with tights pants and a lightning bolt across my face. So instead we just made simple invitations to spend a Sunday afternoon together at the parsonage in order to have some fun. Everyone came and we had a blast. We shared stories and talked about what Staunton used to be like. I saw in my neighbors true friends and realized that I was going to love living on this street. When things were starting to wrap up, and each neighbor was preparing to head home, we said our goodbyes and promised to get together again sometime soon. However, before one of my neighbors left, she asked if she could speak to me for just a moment. Can we, as Christians, properly fit into the world of our surrounding culture? What are the lines to be drawn between accommodation to the reality of culture and unacceptable compromise? For instance: That afternoon I began to wonder about whether or not we, as Christians, can drink alcohol. There are plenty of verses in scripture that speak against it: Do not drink because it leads to debauchery (Ephesians 5.18); Your body is a temple (1 Corinthians 6.19); etc. And there are plenty of verses that allow for it: Jesus’ first miracle was turning water into wine (John 2.1-11); Jesus shares wine with his disciples during the last supper (Matthew 26.17-30); etc. The question at hand is this: Have we grown too comfortable with our cultural setting? Almost every Sunday I have someone approach me after worship to apologize for not being here the previous week. Now I want you all to know that I love each and every one of you, but I do not take attendance at church. When some of you have explained and rationalized your lack of attendance, I honestly did not remember that you were not here with us. I almost always respond with an affirmation of your lack of attendance by saying, “you were where you needed to be!” Most of the time I truly believe what I say, but sometimes I wonder… Have we grown so comfortable with our surroundings that church has become just something to do? Or do we believe it is the location of where we discover something worth living for? Paul feared how much the Corinthians were growing comfortable with their surroundings. Many professed a strong knowledge that there was only one God, so whenever they ate meat sacrificed to idols they knew what it really was. Paul commends them for their knowledge but then challenges them to see that their wisdom is not enough to help those young and weak in their faith. You might know that you can drink responsibly, but would you offer wine to a recovering alcoholic? You might know that you love PB&Js, but would you serve one to someone with a peanut allergy? Each of us has a stumbling block and it might be very different from the people in the pews with us. Maybe you struggle with alcohol. Perhaps you are guilty of lusting after what others have. Some of us might fret too much about the way we look before we leave the house. A few of us might spend more time worrying who will win the Superbowl than we do about the people wandering around downtown who won’t have a warm place to sleep tonight. 1 Corinthians 8 encourages us to shine a light on our lives to see whether or not we are eating in the temples of the idols that surround us. One of the most frightening forms of idolatry for churches today is the overwhelming power of materialism. Christians, whether we like to admit it or not, are enmeshed in economic practices that draw our loyalty away from Christ and divide the community by disregarding the poor and the needy. Other than the irony of fighting for deals on Black Friday after Thanksgiving, Super Bowl Sunday is a sobering reminder of the power of materialism in our world today. What does it say about our culture when tonight we, as a country, will eat so much when so many go without food? And don’t even get me started on the commercials; millions upon millions of dollars have been spent for 30 seconds of ad space when people in our country cannot afford to go to the doctor when they are sick. 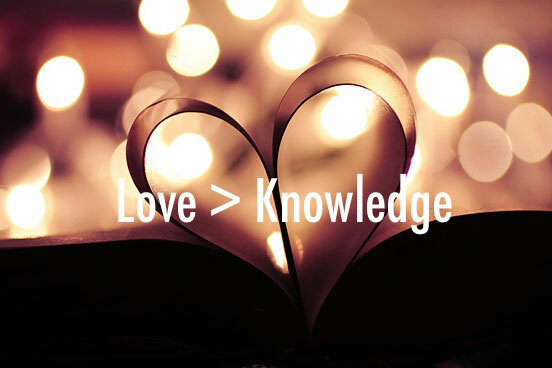 Love is greater than knowledge. Love is more important than our looks, football games, our jobs, alcohol, and everything else in all creation. Love is what sets the church apart from the rest of the world. Love is what conquers all things and helps to show the world turned upside down. Knowing all about the Civil Rights movement means nothing when we speak in prejudiced tones about people who do not look like us. Knowing all about the importance of feminism means nothing when we still degrade women in the workplace and pay them at a lower percentage than their male counterparts. Knowing all about the plight of the poor and needy in Staunton means nothing when we neglect to actually do something about it and let our love become manifest. 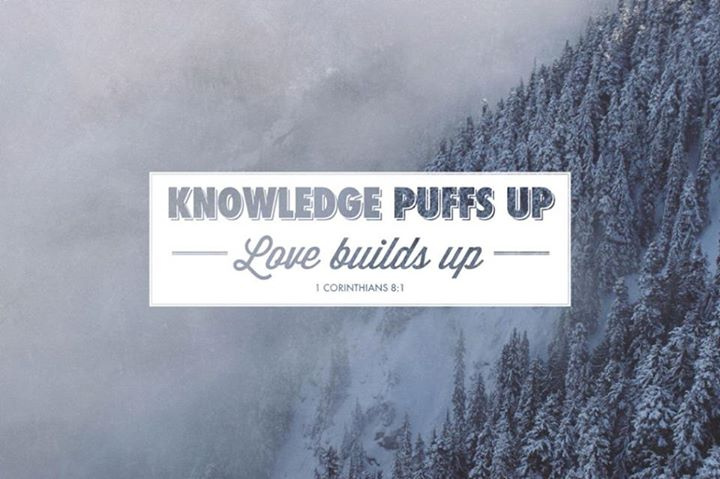 All of us will profit from looking in the mirror of 1 Corinthians 8 and asking whether there are ways in which we are using knowledge as a weapon rather than as an instrument of love. Can we drink as Christians? Can we work hard to earn tremendous amounts of wealth? Can we watch the Superbowl and host big parties? Of course we can, so long as things like alcohol, money, and the Superbowl do not become idols that we worship more than the Lord of life. The idols in our lives will never bring us closer to God. The more time we spend in culturally accepted practices that are disconnected from discipleship, the further we move away from the Lord. For the church in Corinth, they knew that food would not bring them closer to God whether from meat sacrificed to idols or not. Thanks be to God that the meal we will share in just a few moments will no longer be food, but instead it will be the body and blood of Christ. When we gather at the table, love truly trumps knowledge. All of the idols of life fall away and pale in comparison to the gift of God on the cross for people like you and me. The table is where we discover what love really looks like; sacrifice, faithfulness, and hope. We have set up a mirror here at the front of church. When you come up to receive the body and blood I encourage you to take a moment to look at yourself in the mirror, open your eyes to your life and see your own stumbling blocks. Let 1 Corinthians 8 be the mirror by which you begin to wrestle with the idols you worship, so that you can turn back to the Lord and let love be greater than knowledge. Amen.